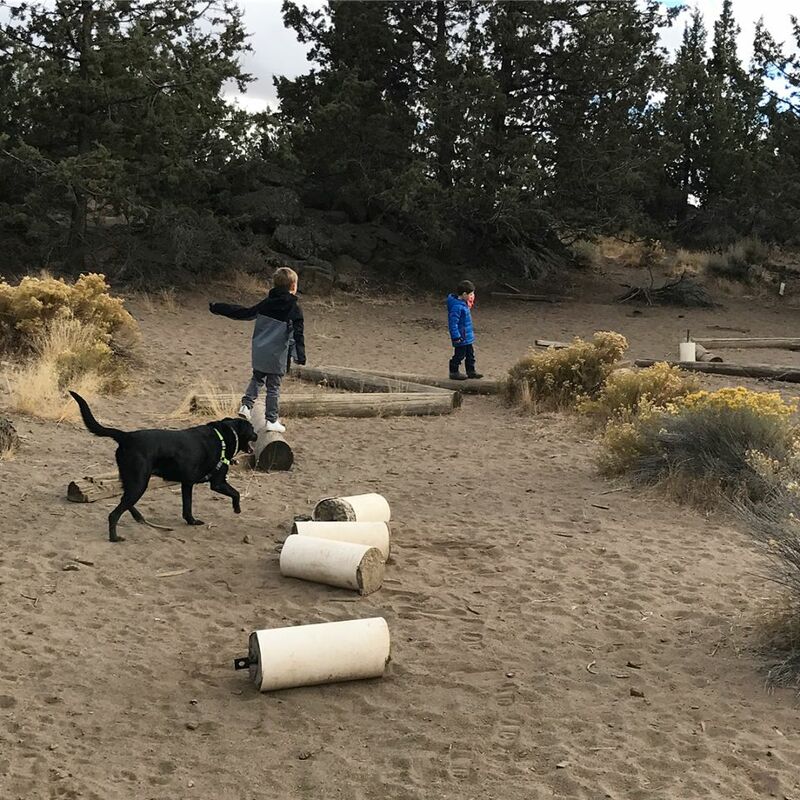 Bend offers several amazing dog parks for you and your pup to frolic about. We happen to love Pine Nursery. Perhaps because it is the closest to our house, but really it is also a pretty awesome dog park. Often times when we are there I have trouble deciding who is having more fun there, Ouzo or the boys. The dog park is 18.8 acres, fenced and also has a separated fenced area for small dogs. When you arrive at the gate you are able to easily unleash your dog and then open the second gate allowing her into the park. Ouzo quickly sprints off checking out all the smells and seeing if there are any nearby friends. She then comes back and lets us know what way she would like us to go. Whenever we are at the dog park we let Ouzo lead the way. This is her domain and her turn to get to be in charge. 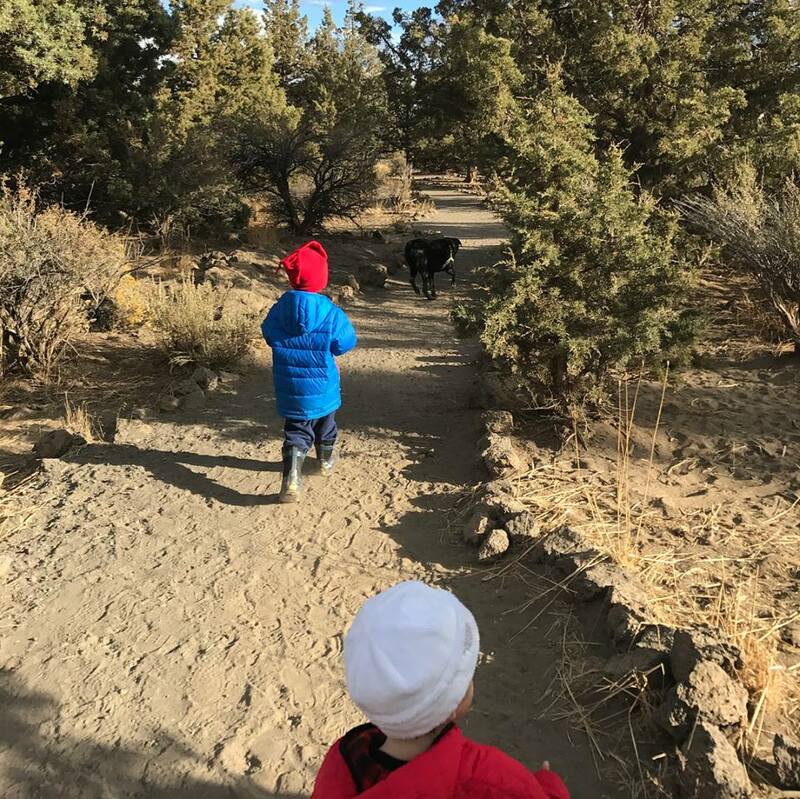 Typically she guides us along the outer fence along the trail to the big grassy field; the boys are running as fast as the can behind her. We play for a bit at the grassy field and then stop at the water fountain for a drink. If it is summer she might run through the fountain to cool off otherwise she makes her way to the fallen logs where she takes a rest and the boys play with there version of an obstacle course. We then climb a few rocks to get to the next trail and make our way to the bench for a mountain view. After a bit more running around we have completed the loop and made it back to our starting point. We love going dog parks and Bend has so many great ones and we feel lucky to have Pine Nursery so close to home.